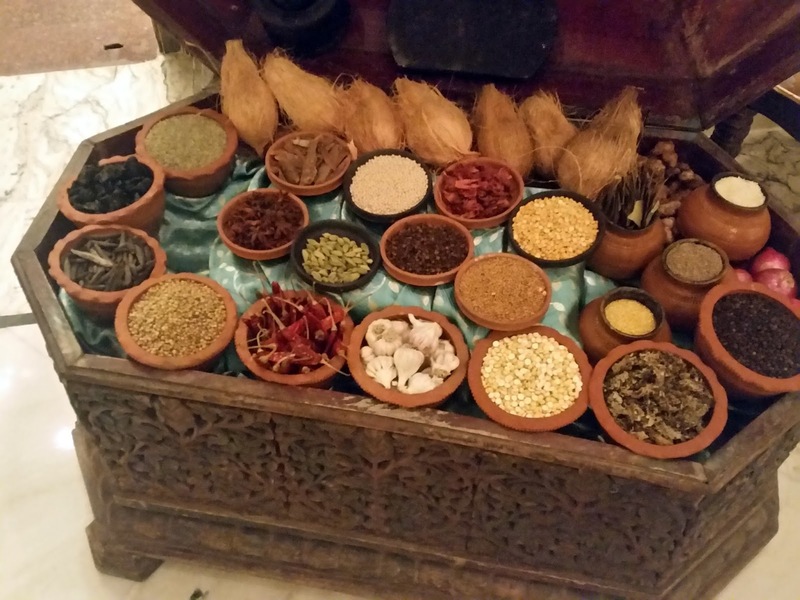 Master Chef Kasi of Dakshin Coastal at ITC Grand Maratha Mumbai is currently at ITC Kakatiya Hyderabad, curating “Chettinad Chronicles” the Chettinad food festival here. Chef Kasi who hails from Chettinad area himself is an acknowledged master of this cuisine. A bloggers table was organized by the restaurant to showcase some of the handcrafted delicacies from the master chef. Chef Kasi explained to us that it is a myth that Chettinad food is always very spicy. He said that the hallmark of the cuisine is the use of a myriad of spices like a variety of peppers, Kalpasi (patthar ke phool), cardamom, jeera, tamarind and even khus khus. Red Chilies provide the spicy edge to the cuisine but only in some dishes, most of the spiciness comes from pepper. Unlike popular belief, Chettinad cuisine has a lot of good vegetarian recipes apart from their signature non-veg dishes like Chicken Chettinad and Meen Kozhambu. 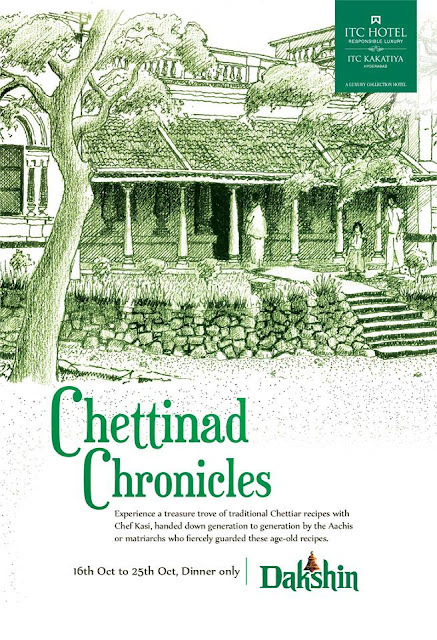 The reason behind this is that Chettiars were originally vegetarians, but being traders they came in contact with people from other sections and regions and imbibed non-vegetarian food into their cuisine. A Chettinad Sappadu has three parts – Aarambham (starters), Bhojanam (main courses) and Madhuram (desserts). 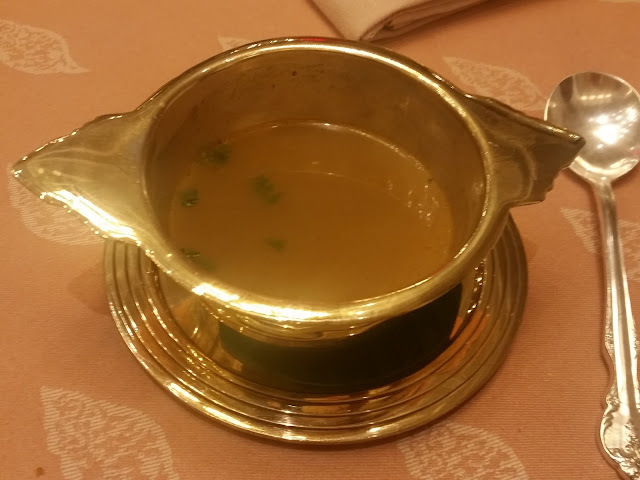 We started with Kozhi Rasam. Kozhi in Tamil means chicken, but the clear rasam had a fair amount of pepper as well as extracts of tomatoes and garlic giving it a unique flavour. The fresh coriander leaves in the soup added to the taste. The highlight of the starters or perhaps the entire meal to me was Kadi Vadai – a kheema and dal based flat masala vada. The flavour of the lamb mince had combined brilliantly with assorted spices and no one could stop at one. 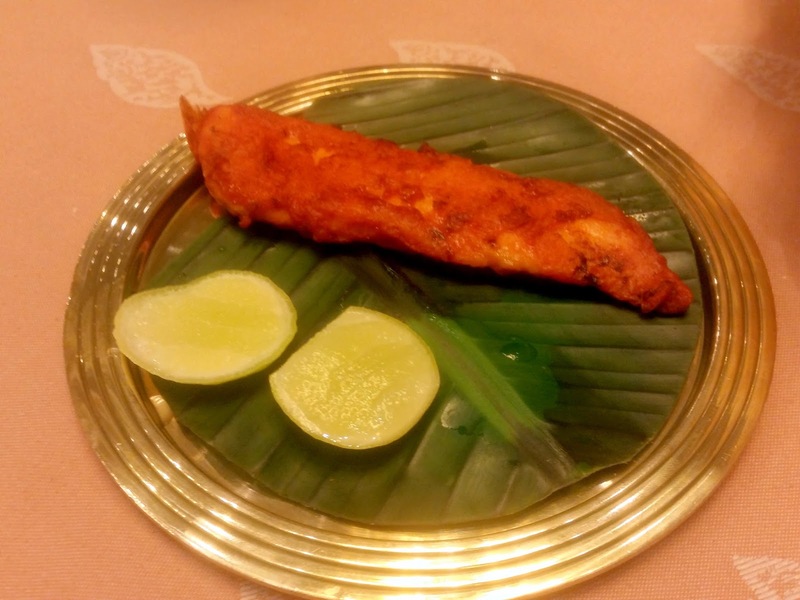 Meen Varuval had a well marinated boneless piece of grilled sear fish – here again the spice mix of the marinade stole the show. Acharya Kozhi Sukka was the other starter which was essentially chicken sauteed in spicy masala. The main thali served with Malabar Paratha and the signature appams from Iyer’s Trolley, which is a permanent live counter in Dakshin restaurants everywhere. But to start with I asked for some rice to go with the Nei Parupu, which was a simple dal preparation with ghee. There was a cauliflower based vegetarian dish which was also delicious and formed a perfect combo with the rice and dal. In the non-vegetarian section, Natu Kozhi Karaikudi Kozhambu or country chicken curry prepared in Karaikudi style was a thick cashewnut based gravy which was quite tangy. Cinna Vangaya Meen Curry or a light onion and tomato based fish preparation had the exact opposite taste – simple and flavourful. The third was a lamb dish with a thick gravy – which I did not find special. 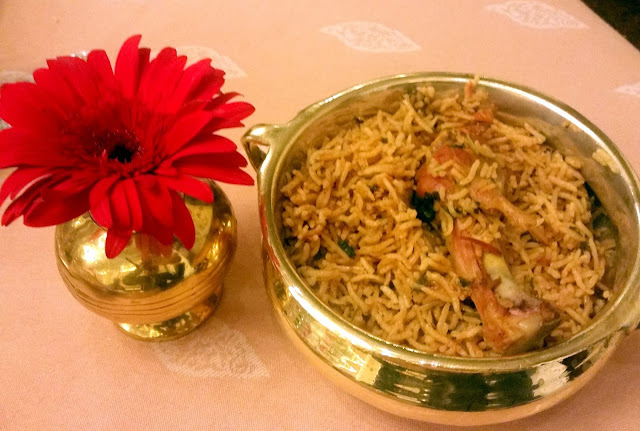 The Kozhi Pulav served next was however so good that there was no need for any salan or raita to have it. 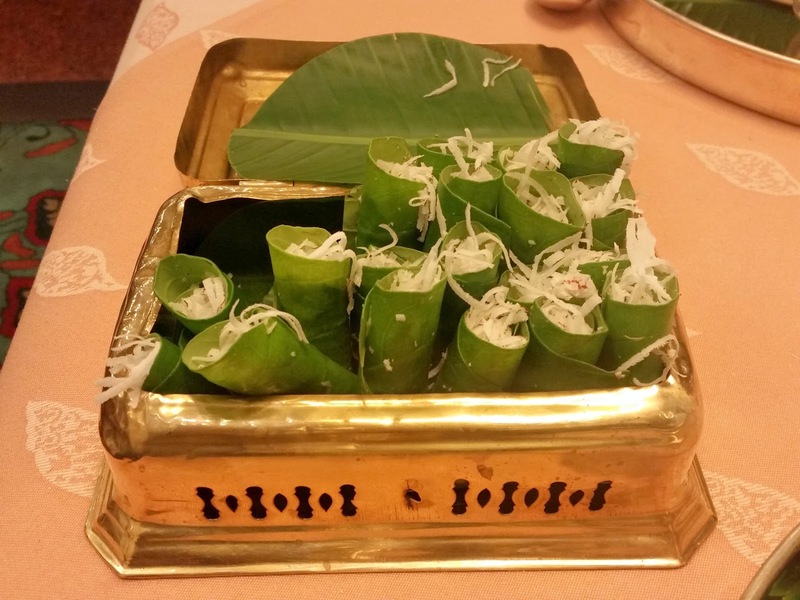 Among the desserts the pick was Sakkara Kolukottai – rice balls in jaggery and coconut milk. This is a must try. Pazha Payasam again had a base of coconut milk, this time with cardamoms along with fresh fruit pieces. I liked the mildness of the payasam. The mandatory white curd was also there. I had a look at the menu for the festival. A few other dishes looked interesting like the Kooni Meen Porichathu – a prawn based starter, Pineapple Rasam, and Kai Kari Mandi – a raw mango flavoured dish of mixed vegetables. 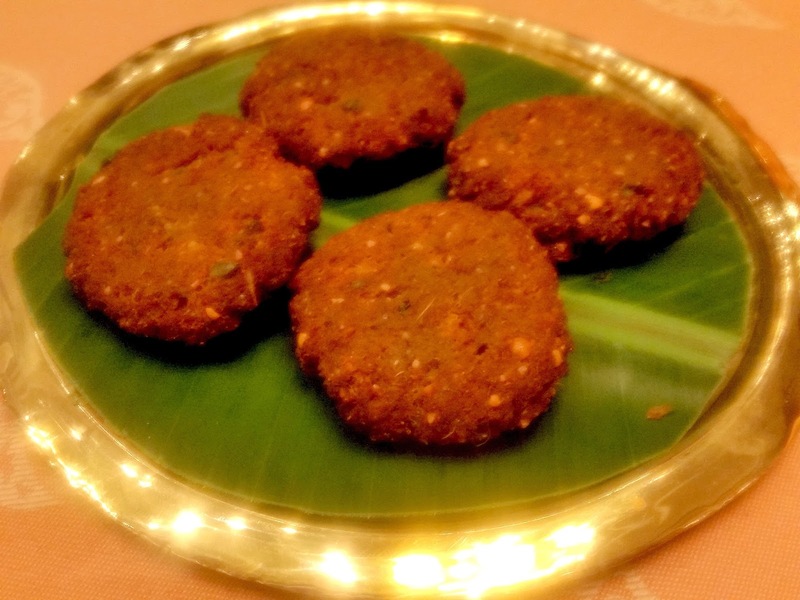 Dakshin is known for its signature paniyarams served with delicious chutneys, and apart from the usual ones this festival has a ragi version of the same. 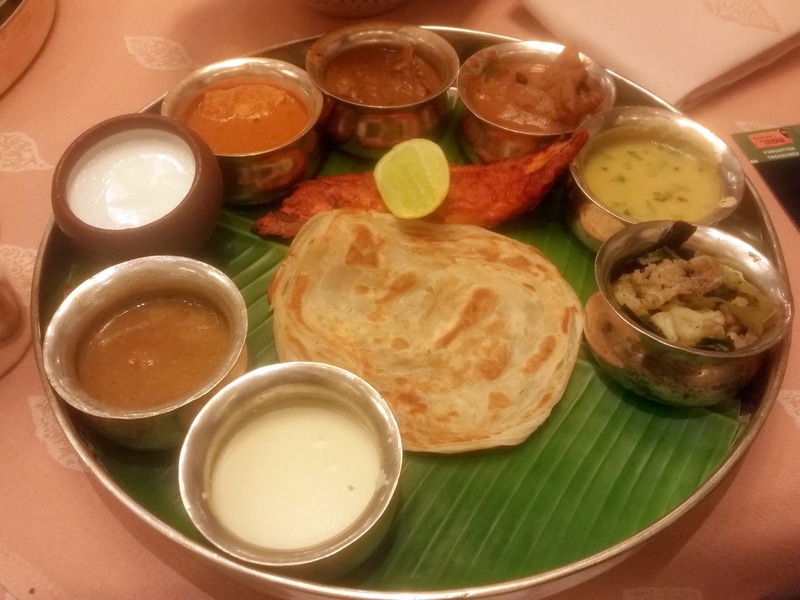 The festival offers a special Chettinad thali both for lunch and dinner. The thali, which includes around a dozen specialties from the cuisine, has three variations – vegetarian, non-vegetarian and seafood. The thalis are priced from Rs 1600-2500. During dinner one can also order some dishes as a-la carte. The festival is on till 25th October.